Our latest Ocracoke Newsletter is the story of Ocracoke's Agnes Scott, direct descendant of Agnes Scott for whom the women's college in Decatur, Georgia is named. You can read the Newsletter here: http://www.villagecraftsmen.com/news062114.htm. Ocracoke is a wonderful community, but it is not perfect...and never has been, of course. The following letter, written in 1811 about the situation on nearby Shell Castle island, illustrates the "humanness" of the folks who lived on these outer islands two hundred years ago. Shell Castle Island was owned by John Gray Blount and John Wallace. After John Wallace died in 1810, Solomon Joseph, one of the tenants, wrote to John Blount about Rebecca Wallace, widow of Shell Castle's "Governor." 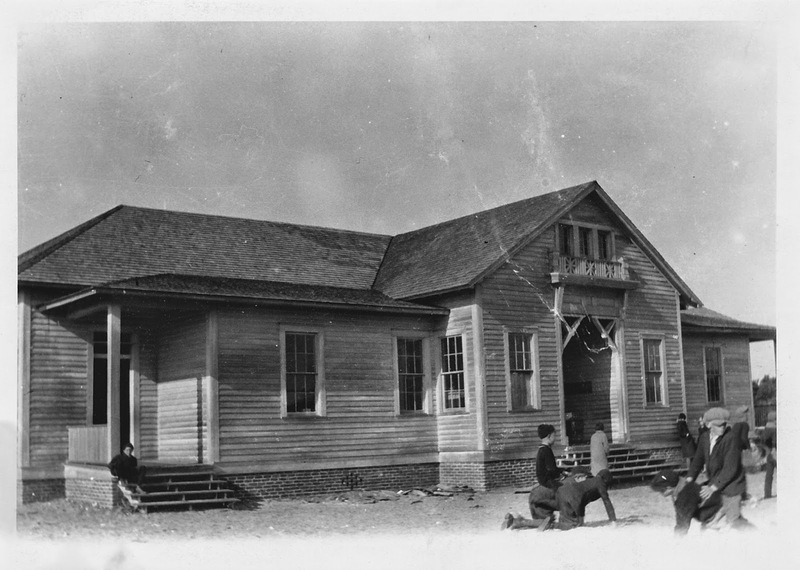 In 1917 a new schoolhouse was built where the current building sits. This handsome new facility included six rooms, each with its own entrance to the outside. The school housed grades one through eight, and soon became a focal point for the community. Eventually Ocracoke School added a high school program. The first graduating class was in 1931 when Russell Williams, Mable Fulcher, and Lucy Garrish finished the eleventh grade (the highest grade available at the time). The present day schoolhouse opened its doors in the summer of 1971. More rooms and a modern gymnasium were added over the next decades. 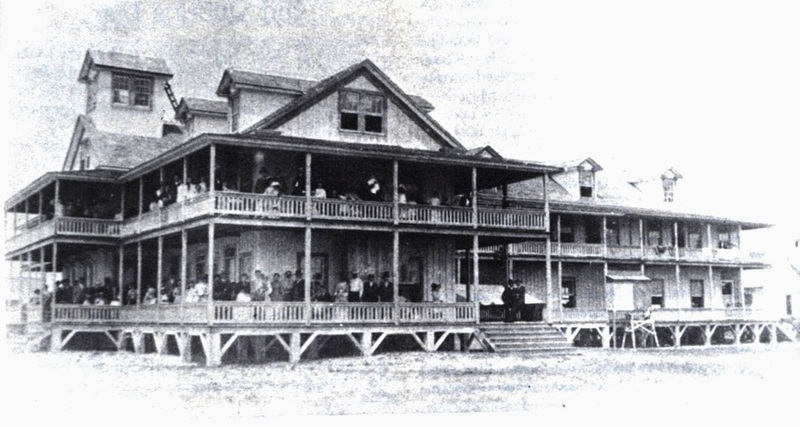 In about 1900 James and Zilphia Howard sold a one acre tract of land to the trustees of "Ocracoke Lodge No. 194 Independent order of Odd Fellows" for use as a "Lodge room or such other purpose as they may deem proper." A two story wood frame building was built in 1901. It housed the Oddfellow's Lodge on the second floor. Soon after its construction two island schools (one located near the British Cemetery & the other in the vicinity of Albert Styron's Store) were consolidated and public school was held on the first floor. In Feb of 1911 B.G. O'Neal was paid $3.74 for taking a census of children on Ocracoke. 187 children of "white race" were recorded [we can be thankful that the state of North Carolina no longer officially sanctions racially segregated schools]. Today the former Lodge serves as the center section of "The Island Inn." 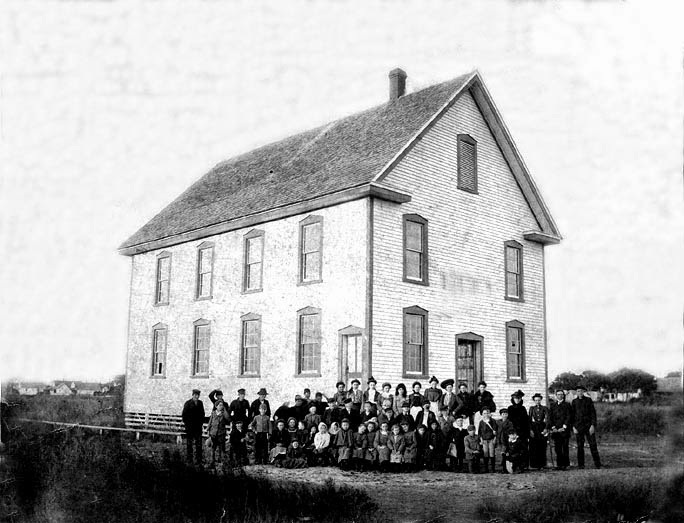 This building served as the school until 1917, when a new schoolhouse was erected where the current school is located. Look for information about the 1917 schoolhouse soon. Summertime is not just for spending the day at the beach. Sometimes it's for spending the evening at the beach as well. We had planned a Solstice bonfire, but postponed the get together until the next night because of thunderstorms. It was still light when Lou Ann took this photo, but we stayed out on the beach until 10 pm, roasting hot dogs and marshmallows. The fire burned brightly as the sun sank below the horizon, and we sat around visiting and sharing stories. If you are planning to have a fire on the beach be sure to get your permit from the Park Service. The rules are reasonable and not very restrictive. And a fire on the beach is a great way to enjoy Ocracoke at night. ...and her husband takes a fence (not offence!). For the past four years Laura Stern has served as pastor of the Ocracoke Methodist Church. She has served admirably...not only the church, but the entire Ocracoke village. Laura and her husband Andrew, and their three children, Gretchen, Nicholas, and Charlie, have been active members of the community, good friends, and wonderful neighbors. Laura was recently reassigned to a church in Raleigh, and they left the island Monday morning. On Saturday afternoon Andrew drove a large moving van down Lawton Lane as we were sitting on our front porch. When he turned onto Hwy 12 we heard a loud crunching noise, and the splintering of wood. Investigation revealed that Andrew had clipped our fence, split the post, broken several palings, and laid an eight foot section onto the ground! Of course, Andrew was mortified, but we assured him we could repair the fence, and he shouldn't fret about it. When Andrew told Laura she sighed and said, "Thank Goodness it was Philip's fence!" I took that as a compliment. She knew I wouldn't be upset. As Andrew said, it was a good wake-up call about the consequences of maneuvering a large truck...and at least it was just a fence, not a 2014 Mercedes on a street in Raleigh! On Sunday night about 40 islanders gathered for a bonfire on the beach. It was a good opportunity for us to bid Laura, Andrew and their children farewell, and to wish them success and happiness in their new community. I am sure we will see the Sterns back on the island periodically. So that will give us ample opportunities to remind Andrew of his less-than-stellar truck driving abilities. Yesterday I shared recollections of a Methodist preacher about his first camp meeting, a revival that commenced July 10, 1873 on Ocracoke Island, and lasted four days. Three services were held each day, and one each night. Rev. Nash says it was a "never-to-be-forgotten experience" and that "there were a number of preachers present." An August, 1873 article in a Goldsboro, North Carolina newspaper, the Goldsboro Messenger, had this perspective on the Ocracoke revival: "At the recent camp meeting on Ocracoke Island, 3,000 persons and 10 ministers attended. Out of this crowd only 5 persons professed religion." It seems as if the sons and daughters of buccaneers and renegades were slow to embrace holiness. In 1916, the Rev. L.L. Nash published a book, "Recollections and Observations During a Ministry in the North Carolina Conference, Methodist Episcopal Church, South, of Forty-Three Years,." " Rev. S.D. Adams, my much loved Presiding Elder, was a great help to me. He came regularly to his appointments in all kinds of weather, and gave us much encouragement by his preaching and fatherly advice. He was one of the best men I ever knew. He arranged for a camp meeting at Ocracoke in July , and ordered me to go to it. 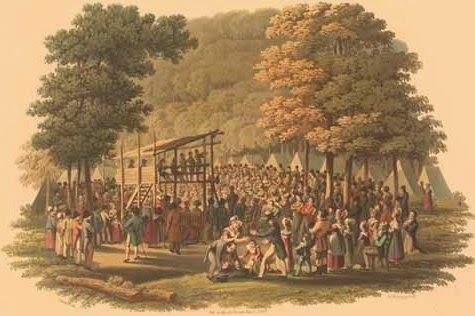 It was my first camp meeting, and the novelty of it made it very interesting to me. I had never been down on the coast; that is, I had never been ashore on the coast: I had been on shipboard along the coast; but there were things ashore that were new to me, among them the millions of sand-fiddlers that scamper around everywhere. After going to bed in the preacher’s tent, the Rev. L.H. Gibbons, who was my bed-fellow, asked the preacher stationed there how high a sand-fiddler could climb? The preacher, a brother Maness, answered: “They don’t climb, they go down in the sand.” Brother Gibbons said: “I saw one on the ridge pole of this tent today.” I imagined that the sand-fiddler was crawling on me all night, and did not sleep very well. 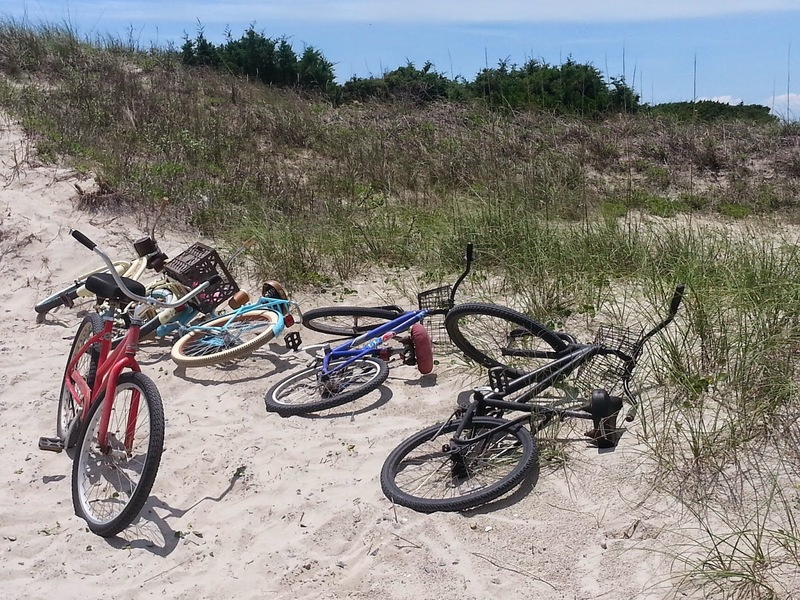 "We spent a week at Ocracoke, and it was a never-to-be-forgotten experience with me. There were a number of preachers present, and we had three services in the day, and one at night. Old father Henry Gray was there, and preached every day. He was a great man in prayer and exhortation; but was never considered a great preacher. But he had a reputation for having his prayers answered; veritable terror to evil doers. It is said, he would pray for the death of incorrigible sinners who would not quit their sins, and come to Christ, and the Lord would answer his prayers, and take them away. For this reason the hardest sinners feared him." Look for the perspective of the Goldsboro Messenger about the results of this camp meeting on tomorrow's blog. In one of the small cemeteries on Howard Street is the grave of Agnes Scott, wife of Ocracoke native, Capt. M.A. Garrish. Agnes Scott was born in Kirkwood, Georgia, and died in Galveston, Texas. Visitors to the island occasionally ask me if this Agnes Scott is related to the Agnes Scott for whom the women's college in Decatur, Georgia is named. As it turns out, Agnes Scott of Ocracoke is a direct descendant of the college's namesake, and a number of island natives are similarly related. Our latest Ocracoke Newsletter (http://www.villagecraftsmen.com/news062114.htm) traces the story of both Agnes Scotts. In an interesting turn of events, my granddaughter, Zoe Howard, will be attending Agnes Scott College as a freshman this fall. Zoe, we wish you all the best in your new venture in Decatur, Georgia! As early as 1785 records indicate that Ocracoke residents were concerned with education. On August 20 of that year the estate of Jobe Wahab made a payment of 4 pounds, 16 shillings to Henry Garrish for "gradeschooling" his son, Thomas Wahab. No doubt Henry Garrish, who likely hailed from New England, was a private tutor. On February 04, 1808, William Howard sold "a certain parcell of land lying where the schoolhouse now stans…." 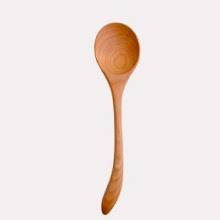 In that 1808 deed William Howard also granted the subscribers of the schoolhouse the "priviledge of giting wood for the benefit of sd School house as far as get enuff for the use of the house of any kind except live oak and cedar…." Presumably he was granting the privilege of cutting firewood on the remainder of his property, which he still owned. One year later, in 1809, Edmond Dailey, one of the witnesses to the 1808 deed, rented land from John Williams. Early in the twentieth century it was said that John Williams' "shell pile" could still be seen near where the Thurston House Bed & Breakfast now sits. This land borders the land owned by William Howard in the early 1800's. The rental agreement, which states that Edmond Dailey would have a house, pig pen and fig orchard, also mentions that Dailey was a school master. This summer, in June & July, National Park Service volunteer, Lou Ann Homan, will open the Ocracoke lighthouse on Wednesdays and Thursdays from 1 pm to 3 pm for viewing. 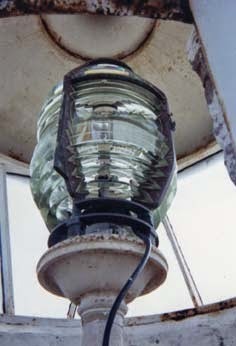 Although visitors will not be allowed to climb the tower (the steep ladder at the top of the spiral staircase, narrow passageways, and cramped quarters around the Fresnel lens in the 191 year old structure were designed only for a professional keeper), they will have an opportunity to step inside the lighthouse, examine the 5' thick brick walls, and gaze up to the top of the stairs. Visitors will also have a chance to chat with Lou Ann who will be able to answer questions about the history and construction of this iconic symbol of Ocracoke village. Be sure to join her there if you are on the island on Wednesday or Thursday afternoon. 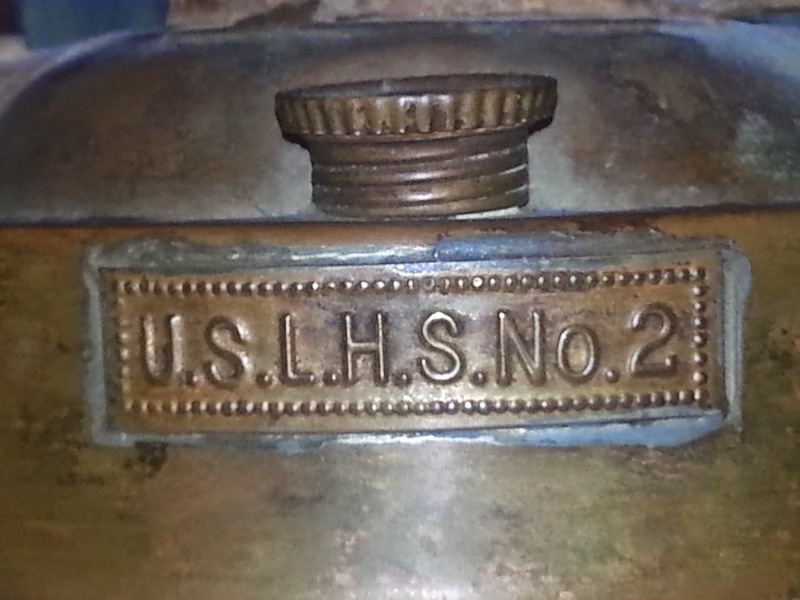 Two days ago I wrote about the bronze pitcher that was used to heat oil for the lamp in the lighthouse (and for those of our readers curious about why the oil needed to be heated, please return to that post and read the comments). 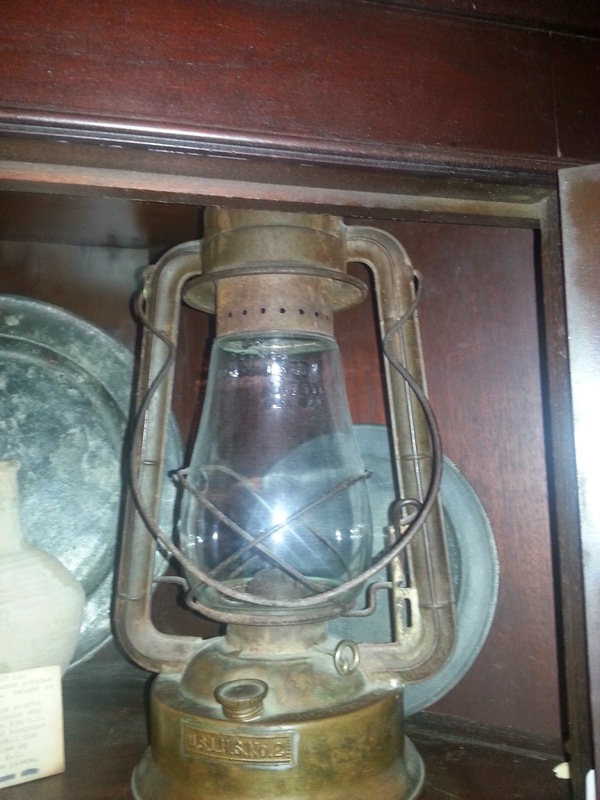 Below are photos of the lighthouse keeper's hand-held kerosene lantern. 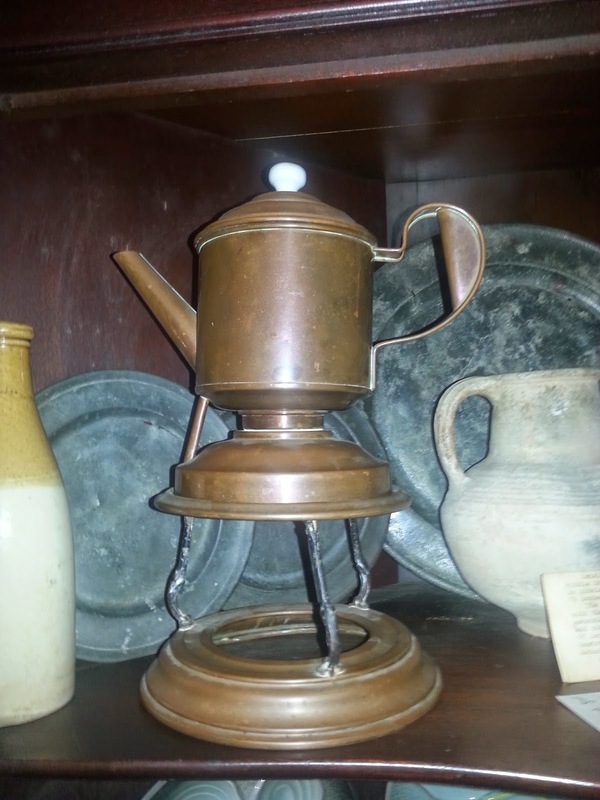 This would have been what the keeper carried with him to light his way as he mounted the steps to the lighthouse's lantern room. On Sunday ten students graduated from Ocracoke School. They are Adam Carter, Carlos DeLao, Alma Flores, Amanda Gaskins, Zoe Huppert, Logan Jenkins, Kade Nagakane, Wyatt Norris, Andrew Tillett, and Alin Villanueva. Village Craftsmen extends hearty congratulations to the graduating class of 2014! Sundae Horn has written an article in the Ocracoke Current that includes a photo of the seniors and a transcript of Andrew Tillett's valedictory address. You can read it here: http://www.ocracokecurrent.com/89363. With a magnifying glass I was able to read the embossed name of the manufacturer: "A. Gruet & CiF Paris 11 Ple St. Sebastie." A July 5th, 1884 letter from Boston resident, T.H. Bartlett to the editors of American Architect and Architecture, Vol 16, has this to say about the A. Gruet foundry: "There is one founder in Paris, A. Gruet, Jne., who as a nobleman as well as founder, is alone sufficient to sustain the reputation of France as a country where great work in bronze-casting is kept in an enviable state of perfection." Yet again our local radio station, WOVV, will be sponsoring Women's Arm Wrestling. 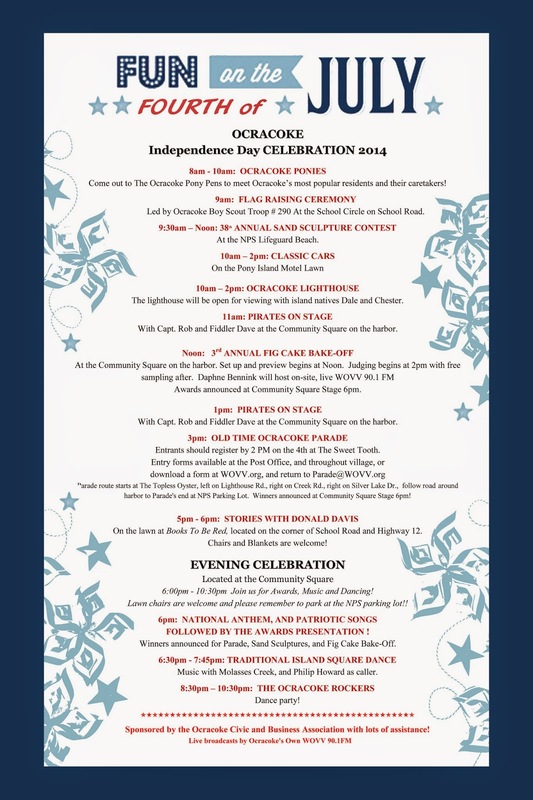 The event is scheduled for this Thursday, June 19 at the Beachcomber Campground. The contests begin at 7 pm. For more information, chick on this link: http://www.hydecountync.gov/news_and_information/docs/WOVV_womens_arm_wreslting_June_19.pdf. As you can see, the costumes are always creative, elaborate, and quirky. Of course, the enthusiasm and excitement is palpable. Come on out for a fun evening's entertainment...and to contribute to a good cause. Commercial fishing is alive and well on Ocracoke, as demonstrated by this photo of local nets I took not long ago. Whenever you are on the island be sure to stop by the Ocracoke Fish House for fresh, local seafood. It doesn't get any better than that! Can you even imagine this comment from a plumber: "I've been working hard all week, but some of my plumber friends are getting together this evening to dig up a septic field just for enjoyment. I think I'll stop by and join in the fun. We won't be getting paid, but, hey, it will be a jolly good time!" Or this one from a doctor: "A few colleagues are coming over to the house tonight. We're going to have some snacks and a few cold ones. Then we're going to unpack a realistic dummy and pretend we're operating. We've got IV tubes, heart monitors...an entire faux operating room in the basement. This isn't about working towards a degree, or certification. We just love our work so much we want to keep at it in our spare time. Come on over about 6 o'clock. We'll be 'operating' until at least midnight." But something very similar happens every year...on Sunday evening of the OcraFolk Festival. That's when many of the musicians who have traveled to Ocracoke from afar, and who have worked all weekend providing lively and spirited performances, gather at my house for a final jam session. These talented folks come together just for the sheer delight of making music. They bring their guitars, fiddles, dobros, basses, keyboards, and drums...and play until after midnight. In the photo above five fiddlers (Dave, Rob, Libby, Ben, & Cassie) join together for a spontaneous and rousing burst of fast-paced tunes that brought cheers from their fellow musicians. It's their passion for music that sustains these wonderful people. We are so fortunate to have them in our lives. In case you are triskaidekaphobic, here is some good news for this Friday the 13th. 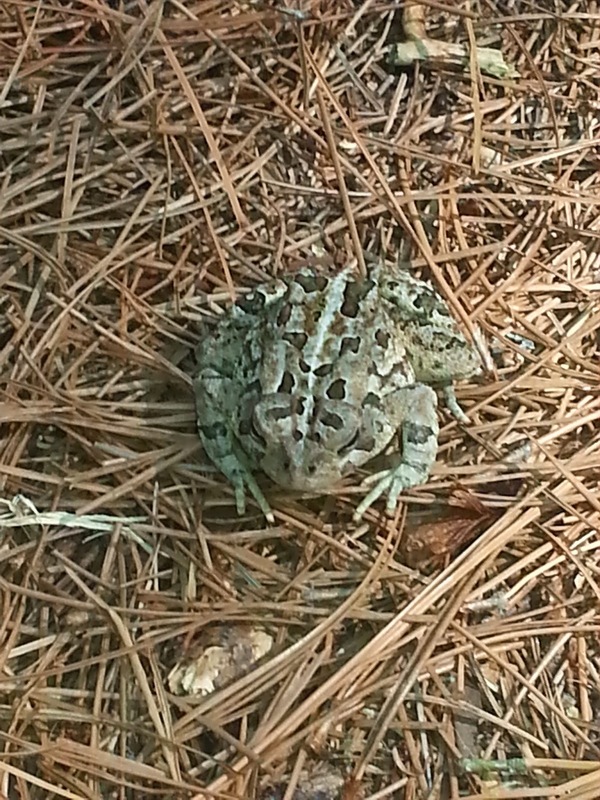 Although I had not seen many toads on the island recently (I believe most of them were drowned in hurricane high tides in the last several years), I have noticed several along the Hammock Hills Nature Trail earlier this month. It is good to see these amphibians looking robust. I believe they are a sign of a healthy environment. I am not much of a gardener, but was intrigued when my friend, Susan, told me about the agave shoot that had made its appearance on Terrapin Drive. We drove up there to take this photo. The plant itself is huge, with giant leaves. But the new stalk rises up to the power lines. It is quite impressive. This weekend's OcraFolk Festival was a huge success. There were so many fabulous musicians, artists, and other performers that I became totally engrossed in the activities, and hardly took any photographs. Below are four pictures that I took, and three that Lou Ann shared with me. In 1974, when Julia Howard wrote her musical, A Tale of Blackbeard, she took some liberties with the history of that infamous seafaring brigand. She invented an island boarding house (or was it a bawdy house?). Well, actually, the boarding house was only partially invented. A century and a half after Blackbeard's demise there really was an Ocracoke boarding house run by Miss Euphemia Curtis. Miss Euphemia (1819-1882) was the great-great-granddaughter of William Howard, Sr., colonial owner of Ocracoke Island. Her boarding house sat between the Village Craftsmen and the School Road. Miss Euphemia is buried behind the Village Craftsmen. I recently discovered this notice in the New Berne Times, dated June 14, 1873: "Mr. Editor: For the benefit of your patrons who desire to attend the Camp Meeting at Ocracoke, commencing the 10th of July, I will state that they can obtain good accommodation, at a reasonable rate, by applying in time to Mrs. Euphemia Curtis at that place. Very Respectfully, A.W. Simpson, Jr."
She lives with Christ our head. William H. Fulcher...............Sum per annum: $235.00 Accepted March 8, 1875. Contract made with William H. Fulcher, dated March 8, 1875, at $235 per annum. Leave Ocracoke Friday at 8 a.m.; arrive at Hatteras next day by 10 a.m.
Leave Hatteras Saturday at 10.30 a.m.; arrive at Ocracoke next day by 4 p.m. Bond required with bid $200. The following North Carolina record comes from "Congressional Series of United States Public Documents, Volume 1693" and is titled "Offers for Carrying the Mails." Perry Coleman Howard……Sum per annum: $588.00 Accepted March 8, 1875. Contract made with Perry Coleman Howard, dated March 8, 1875, at $588 per annum. Leave Beaufort Tuesday at 10 p.m.; arrive at Ocracoke Thursday by 4 p.m.
Leave Ocracoke Monday at 8 a.m.; arrive at Beaufort next day by 4 p.m. Bond required with bid $500. Perry Coleman Howard was cousin Blanche's grandfather. The Community Store reopened its doors on May 24 after being closed for three years. Established in 1918 by Mr. Amasa ("Mace") Fulcher, the store soon established itself as the focal point of commerce and social activity on the "Creek" side of the village. As island tourism expanded, the Community Store porch, with a long bench and comfortable rockers, became a favorite place for locals and visitors to retreat from the sun, relax, and interact. Lauren & Joseph, the new proprietors, have had a few unexpected set-backs in getting the shelves stocked, but new items are arriving regularly. You will find fresh produce, organic items, and baked goods, along with cold drinks and snacks. The new entrepreneurs are excited about stocking a larger selection of organic foods as well as milk and eggs from an eastern North Carolina dairy. Lauren & Joseph plan to expand their products with beer & wine, selected marine items and beach supplies (sunscreen, chap stick, etc.). Before the end of the season they hope to offer deli sandwiches and seating on the rear deck on the shore of Silver Lake. Be sure to stop by, do some shopping, and encourage the Community Store's new owners to continue working to bring new life into this iconic island business. You can read a history of the Community Store here: http://www.villagecraftsmen.com/news092106.htm. In 1718 Tobias Knight, Secretary of the Colony of North Carolina, and Collector of His Majesty's Customs, penned a letter to Edward Teach. The letter begins "My ffriend," and continues with further indications of a close connection between the colony's highest officials and the pirate captain. If this finds you yet in harbour I would have you make the best of your way up as soon as possible your affairs will let you. I have something more to to say to you than at present I can write; The bearer will tell you the end of our Indian Warr, and Ganet can tell you in part what I have to say to you, so referr you in some measure to him. I really think these three men are heartily sorry at their difference with you, and will be very willing to ask your pardon. If I may advise, be ffriends again, its better than falling out among your selves. I expect the Governor this night or tomorrow, who I believe would be likewise glad to see you before you goe, I have not time to add save my hearty respects to you, and am your real ffriend, And Servant. Ever since the state of North Carolina began paving island roads in the 1950s, bicycles have been a popular method of local transportation. But bikes do not work well in sand. This photo was taken at the airport ramp on Memorial Day weekend. These are just a few of the many bikes laid down by the side of the path. The riders made it that far before abandoning their bikes and walking across to the ocean for a few hours in the sun and surf. If I remember correctly, the first women to secure jobs as deckhands on North Carolina ferries were hired in the 1970s. Even then, some men considered it "bad luck" to have women working on boats. Much has changed since then. Today a number of women work on the ferries, and a few are captains. "An imperfect diary, kept by Gen. John Gray Blount [1752-1833], contains some interesting information. He states that when he was a very young man, an old man on Ocracoke told him that the first vessel ever piloted over Ocracoke bar, was brought in by a woman name Patsey Caraway, and at that time the channel ran so near the land that you could 'chunk a biscuit' on the deck of a vessel." Native islanders almost always refer to our harbor as "The Creek." More formally it is called "Cockle Creek," a name used for generations. Prior to WWII this picturesque body of water was shallow...not more than four feet deep. On the southeast border of the creek two languid streams (the "Big Gut" and the "Little Gut") ebbed and flowed as they carried brackish water toward the "bald beach." The harbor was, and still is, a tidal creek that is connected to Pamlico Sound by "the ditch," the narrow opening used by ferries and other water craft. In the 1930s, and again during WWII, the Creek was dredged to provide a suitable harbor for larger boats and US Navy vessels. In the process, the two streams were filled in. Local oral history suggests that native islander and entrepreneur Stanley Wahab re-christened the harbor "Silver Lake" after the initial dredging operation in order to attract tourists. There is no doubt that Stanley Wahab popularized the more colorful name in order to promote his new "Wahab Village Hotel" (now Blackbeard's Lodge). The designation "Silver Lake" is older than that, however. In an 1890 newspaper promotion in The Daily Journal (New Bern, NC), the Spencer brothers, new owners of the Ocracoke Hotel (1885-1900), refer to "Silver Lake, a beautiful sheet of water...immediately in the rear and offer[ing] a sail for the timid who fear the sound or ocean, a bath for those who dread the surf, and fishing for any one who prefer to angle for perch rather than trout or blue fish." The Spencer brothers were from Washington, NC, and it took many years for islanders to feel comfortable with the new name for our harbor. Even today, most O'cockers continue to call the harbor "The Creek." 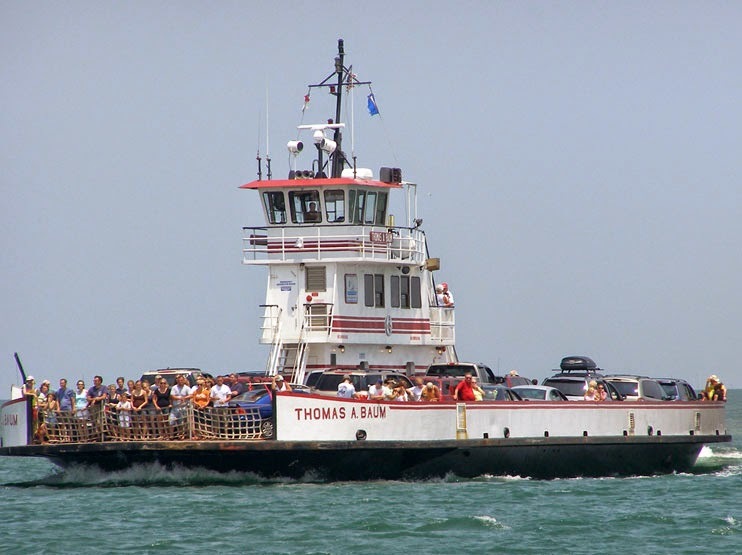 Hatteras-Ocracoke: On the Ferry System's most popular summer route, motorists who arrive at Hatteras before 10am or after 3pm will generally avoid the daily crowds, as will travelers who get to Ocracoke's South Dock before 2pm or after 7pm. In addition, the busiest summer days on the Hatteras Inlet route are Tuesday, Wednesday, and Thursday. "People who make their day trips on Monday or Friday stand a much better chance of avoiding long waits," says Hatteras Port Captain Walter Goodwin.